To permanently delete a drawing file, select the drawing you want to delete and use the Delete Selected Drawings command. Deleting a drawing file is an operation that cannot be undone. 1. In the Timeline or Xsheet view, select the drawings to delete. 2. 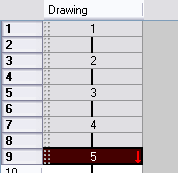 In the top menu, select Drawing > Delete Selected Drawings.